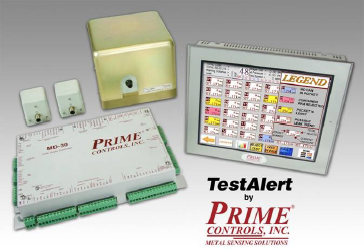 November 1, 2011, Dayton, Ohio – Prime Controls Inc., a leading provider of metal sensing products for the Metal Packaging industry, is pleased to announce the unveiling of their newest product, TestAlert, which dramatically upgrades can leak testers with twenty-first century technology. “TestAlert was designed to replace the previous generation of can leak tester controls, such as the MD2, MD3 and MD20 in 3-Piece can making plants where the need for high efficiency and minimal downtime is great,” states Larry Tucker, President of Prime Controls. Prime Controls had been servicing the previous generation of can leak tester controls for some time, when the need for such an update became obvious. “We noticed that while servicing the older controls, many of the through-hole components of the older can leak tester controls were becoming hard to find or obsolete,” states Mark Mohn, Sales Manager for Prime Controls. TestAlert has been designed with this in mind, using all new components and assuring long term reliability. The system consists of three components: the Absolute Pressure Transducer, the MD30 Control and a Human Machine Interface. The Absolute Pressure Transducer ensures uniform leak testing from pocket to pocket, machine to machine, line to line and even plant to plant, collecting and processing a multitude of data. The MD30 Control is the heart of TestAlert, incorporating the latest technology with a fast processor, operating beyond any known testing speed. The HMI makes using TestAlert very simple, with a touch screen display, colorful alerts, recommended courses of actions and more. Many additional features of TestAlert will prove to benefit and breathe new life into older can leak testers. Among these features include networking capability, absolute pressure reading and simple set-up. The networking capability allows RSS feeds to send alarms to outlook or other RSS viewer systems. Future enhancements are underway to allow for email reporting and remote access. The absolute pressure capability produces the pressure in true PSI, as opposed to a binary number seen in previous generation controls. The system is simple to set-up with step by step instructions, leading the user through the process. “We are very excited about the launch of TestAlert. We have spent several years developing the product based on the needs of the customer. There isn’t any other system like it on the market,” concludes Larry with a confident nod.